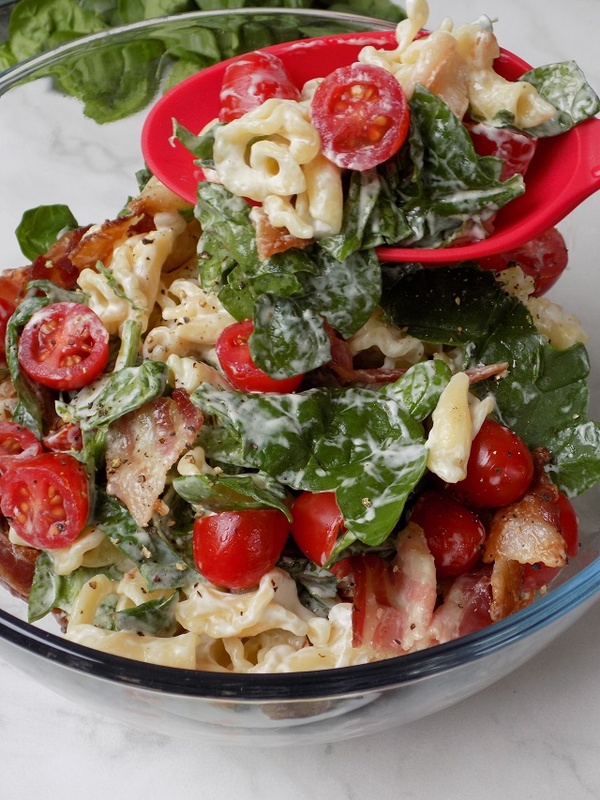 One Savvy Mom ™ | NYC Area Mom Blog: BLT Pasta Salad Recipe - Super Simple, Super Tasty! BLT Pasta Salad Recipe - Super Simple, Super Tasty! Looking for the best pasta salad recipes for upcoming summer BBQ's? 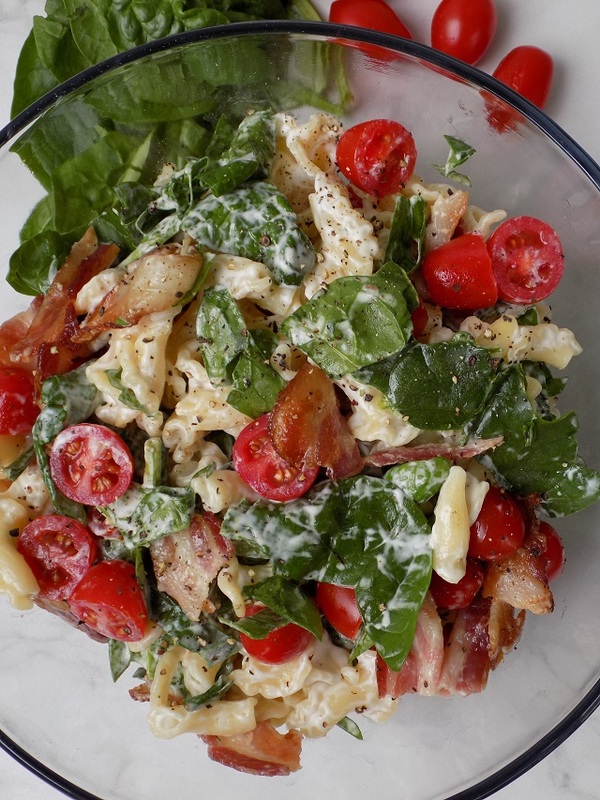 This BLT Pasta Salad is sure to become a fast favorite! It's loaded with bacon, sweet grape tomatoes and fresh spinach, and it all comes together perfectly with a light zesty dressing. Hi friends, how have you been? This past week was a bit of a blur. We were buried in school work with the kids and work, and the weekend seemed like it would never come! Once it did, I made sure to sit and relax for a few hours, because I know we're in for another busy week ahead. I made simple recipes over the weekend, and spent the rest of my time relaxing with the kids and watching a few old favorites on Netflix. It was just what my soul needed to re-energize, so that I can do it all over again this week. I put together a very simple lunch over the weekend that included this BLT Pasta Salad, and my crew absolutely loved it! Whether you're serving it on it's own as a light lunch or you're bringing along to a summer cookout - it's sure to be a crowd pleaser! 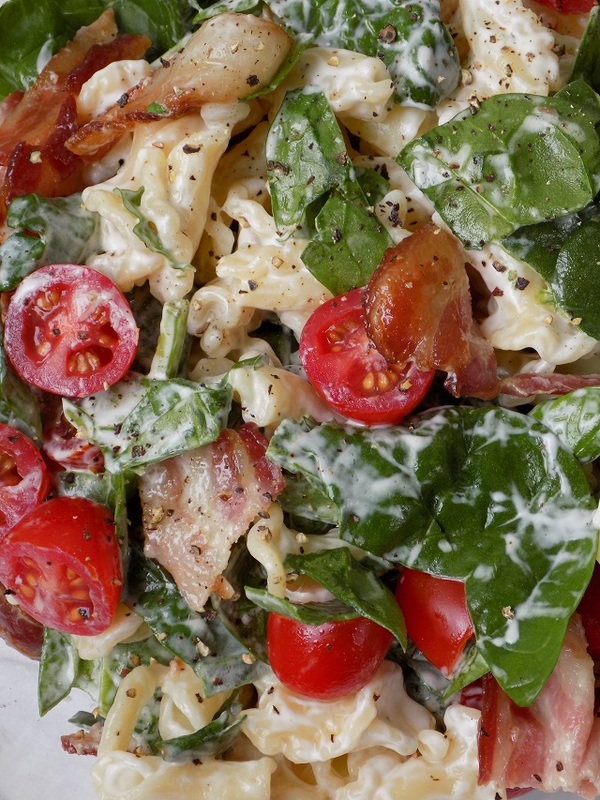 Grab my simple BLT Pasta Salad Recipe, below. 8 oz. fresh spinach washed, drained / dried. 2 1/2 cups grape tomatoes washed/dried and halved. Optional: fresh cracked black pepper. 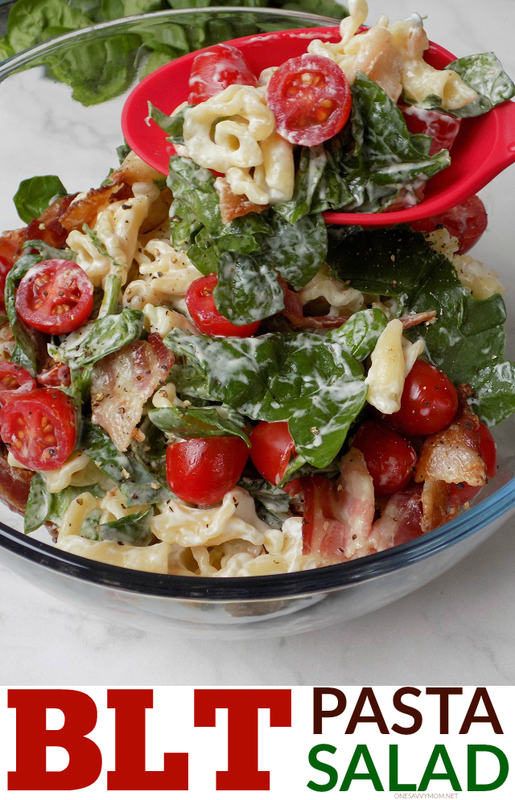 In a large mixing bowl, combine pasta, bacon, grape tomatoes, and spinach. Toss until ingredients are evenly combined. In a separate bowl, combine milk, ranch dressing mix and mayonnaise. Whisk until combined well. Pour dressing over pasta salad and toss well until ingredients are evenly coated. Optional: finish with fresh cracked black pepper to taste. Serve as a light lunch, or as a side. I've made something similar to this which my family LOVES. After seeing this, next time I'll add spinach...looks good!